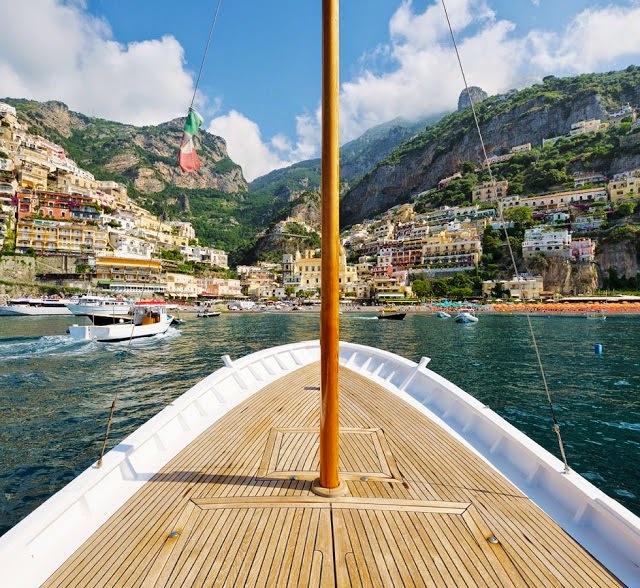 "As our boat made its way through the azure waters of the Tyrrhenian Sea towards Positano Bay, I inhaled the warm breeze and gave gratitude for this blessing. There, like a crown jewel amidst the steep rocky cliff of Italy’s Amalfi Coast laid Positano, a place so enchantingly beautiful that its memory remains etched upon my heart. Sun drenched homes built on a series of cliffside ledges cascaded down to the shore in a panorama of pastel hues, ocher, and vermilion. The gold and green mosaic dome of the legendary Church of Santa Maria Assunta glistened underneath a crystal blue sky. Tropical flowers and lemon and olive groves beautifully displayed in harmonious union. A landscape so romantic it has inspired painters and photographers the world over. Ever since watching the romantic comedy “Only You” I have dreamed of visiting Positano and its renowned hotel - Le Sirenuse - a Moorish Baroque 18th century villa with spectacular views of the sea and the famed Costiera Amalfitana. Once the summer residence of the Marchesi Serale family, members of which still manage this luxury property, it is now the place where dreams are made. And on this special day they happened to be mine. The moment you enter the glass doors of Le Sirenuse you are enveloped in a world of understated elegance and serenity. The impeccable grounds boast white washed walls, arched and vaulted ceilings and gleaming handmade ceramic tiles. Antique paintings and prints framed in handsome mouldings hang on the walls, while a stylish combination of traditional and contemporary furnishings decorate the interiors and rooms. A handwritten welcome note, fresh fruit and nuts, and a bottle of Champagne awaited our arrival. Frette bed linens of the finest quality were perfumed with lavender. The bathroom was made of prestigious marbles with a Jacuzzi tub fit for two. Luxurious Eau d'Italie bath and body products imbue their lovely scent throughout. The terrace, with its glorious views, was the perfect place to sit, sip Champagne and relish this moment. The pool, perhaps my favourite space on the exclusive grounds, was surrounded by lemon trees and breathtaking vistas. Our days were spent relaxing poolside enjoying our favourite Italian aperitivo “Aperol Spritz” and marvelling at the beauty that surrounded us. This small corner of paradise was the perfect place to bask in the final days of summer. Everywhere staff greeted us by name. This special touch provided a sense of being among family and friends, and maybe it was in this spirit of home that on our first evening we decided to dine on our terrace. Positano glowed under the night sky, a vision so heavenly I wished time could stand still. The following evening we enjoyed fresh oysters and a glass of champagne millésimé on the candlelit terrace of the Champagne & Oyster Bar. The soft music and balmy summer night lulled me into a state of utter relaxation before heading for dinner at La Sponda, the hotel’s Michelin star restaurant. What an unforgettable experience and atmosphere dinner provided! The space was lit by four hundred candles as musicians played old Neapolitan love songs. We dined on a selection of Mediterranean inspired dishes and sipped wine. It was one of those rare moments when everything in the universe seemed to conspire to remind me of the infinite beauty of life and love. It was a moment to be savoured slowly, passionately, and with every ounce of my being.